When you’re renting, home improvements aren’t always an option. When I first moved out on my own, I paid little attention to fixing the place up. My budget was tight and I had just graduated from college, where home décor was equated with empty liquor bottles and hodge-podge furniture. After a while, though, living in a space that wasn’t any better decorated than my college housing situation got old. Plus, it’s pretty embarrassing to invite new, put-together friends over to an apartment that I take no pride in. I made it my mission to live like an adult, even when my earnings didn’t quite reflect that stage of life. Here’s how I was able to level up my living situation on the cheap, and how you can budget your first apartment decor as well — even if you rent. Half my treasures came from the stuff moving families didn’t feel like renting a larger truck to take along. Some of my best finds? A quality writing desk for $15, a proper dining table and chairs for $50, and an ergonomic computer chair for $5. Even though I normally enjoy sleeping in on Saturday, getting up early to hit yard and moving sales was worth it. Of course, a lot of your secondhand searching can be done online, too. Many communities have local “yard sale” groups on Facebook, or you can search for specific pieces with the Facebook Marketplace function. Craigslist also remains a classic way to score furniture online. You can find wildly out-of-your-budget furniture for a fraction of the price if you exercise patience and persistence. When I’m just eating dinner on my couch, it’s no big deal to have matching plates. But the first time I made dinner for a group of friends, I realized that two plates, three mismatched bowls and a set of plastic cups previously used in an elementary school classroom (really) weren’t helping me feel like a mature adult. You probably don’t need place settings for eight, and there’s no reason to invest in nice china. Any home furnishings or department store will have plenty of dinnerware options at various price ranges, so you can pick up a matching set without blowing your budget. I actually found some great matching plates and bowls at a local church sale for pennies on the dollar, and it’s helped me serve up home cooking with actual presentation value. Movie posters and printed photos add a great amount of personality to your apartment, but they can look messy when they’re taped directly to the wall. Faced with expansive, white wall space, I decided to invest in frames that gave my artwork and personal memories an organized, neat appearance. Dollar stores, craft stores, and any department store will have frames available in standard sizes. I recommend picking a color scheme or look you want to go for, so you can deal-hunt for frames without getting mismatched materials. And remember that custom artwork or prints might have sizes that require custom frames, in which case you might have to save up a little money to take your wall hanging to a specialty shop. Throw pillows can hide tiny couch spills and add a touch of color to an otherwise drab indoor color scheme. 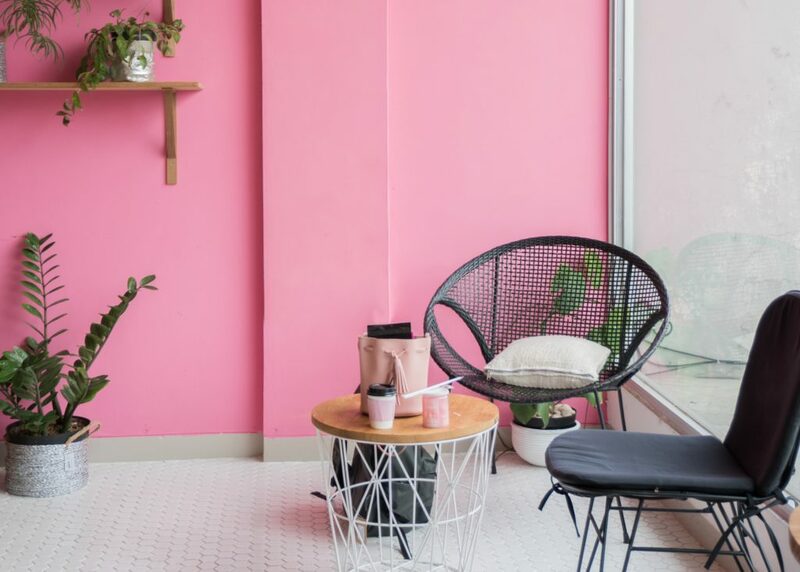 I’m convinced that somewhere, a paint manufacturer mixes up entire batches of bland ecru for use by tenants only — so little pops of color can make a huge impact. You can even try using what you already have to add a touch of personality. As a reading fiend and writer, I have a ton of books. Using them as accessories rather than stacking them in dusty corners helped me turn what used to be a hoarding problem into a decorative choice. My nicer hardcovers look great on wall shelves, letting me give a formerly juvenile apartment an intellectual air. Even quality furniture can’t offset the immature look of dingy window blinds or complete exposure. Curtains don’t have to cost a lot, and mine really brought the look of my place together. Even better, they helped protect my living space from any unwelcome eyes. Pro tip: In most areas, certain window treatments are considered fixtures that by law default to staying with the property. Consult with your landlord and draw up a written agreement permitting you to take curtain rods, shades or other coverings with you when you move. House plants make any space feel cozier, and they also help improve indoor air quality. I don’t know about you, but I’ve yet to have my landlord dial me up and say he’s hiring someone to come clean the air ducts. Adding more plants helped me breathe easier while making my dwelling look more grown-up. Were you born without a green thumb? Artificial plants can improve the look of your abode, too, but you’ll miss out on the breathing benefits. Try succulents for a cute plant that’s hard to kill. Like a lot of folks just starting out, my budget makes saving for big purchases challenging. Before splurging on any items costing more than $200, I made myself wait at least 24 hours before clicking the “buy” button. I also did my homework by shopping around for furniture. When I needed a new couch, for example, I priced potential new sofas on at least 10 different furniture store sites. Since I lack a vehicle big enough to transport such a large item anyway, I also enjoyed the ability to have furniture delivered and set up for me for a reasonable fee. Since upgrading the flat where I spend my evenings, I no longer feel too embarrassed to invite new friends and co-workers over for movie night. I haven’t quite tackled a dinner party yet, but I now have the table to do so should I get the urge to try. However, the best thing about upping my level in the apartment-dwelling game is feeling truly at home when I walk in my front door.